Cracked open my 150 delicious squares book and baked up some mincemeat squares. 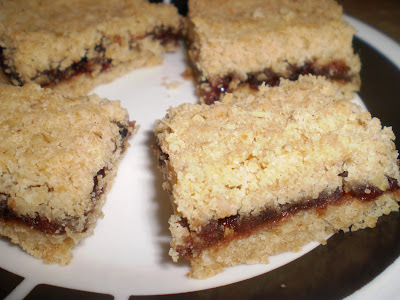 If you love date squares and mincemeat, theses are a super yummy merge! full book title/ author OR recipe?????? I'm drooling here......or did I miss it somewhere else?????? I LOVE date squares AND mincemeat!!!! Sorry LOL! I forget sometimes what stuff I put on Facebook and what I put on here, its Jean Pare's (Company's coming) 150 delicious squares, BEST book for squares ever. My mom finally bought me one of my own for Christmas since I call her to find out recipes from hers all the time lol. Oh Jane, I just had one for breakfast with my coffee all cold out of the fridge..oh yum lol!